In this lesson, we will learn how to decide whether the rule of sines or the rule of cosines is most appropriate for solving a non-right triangle problem. 𝑀 is a circle with radius 24 cm. A chord is drawn whose central angle is 6 2 ∘ . 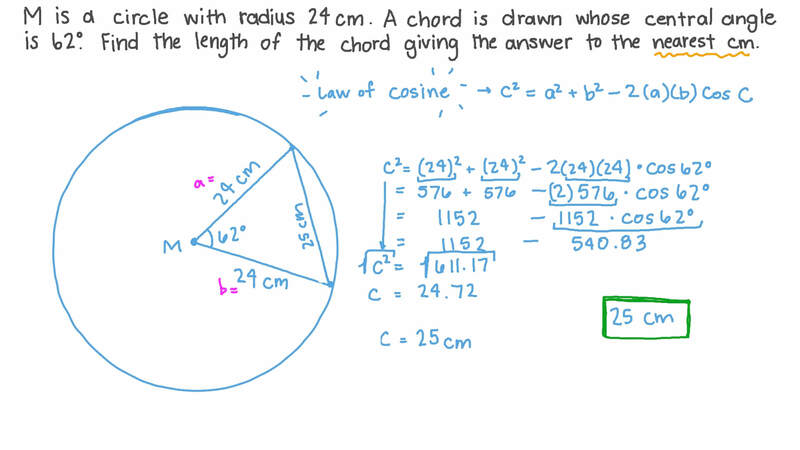 Find the length of the chord giving the answer to the nearest cm. 𝐴 𝐵 𝐶 𝐷 is a parallelogram where 𝐴 𝐵 = 1 0 . 2 c m , 𝑚 ∠ 𝐶 𝐴 𝐵 = 3 4 1 8 ′ ∘ and 𝑚 ∠ 𝐷 𝐵 𝐴 = 6 3 1 2 ′ ∘ . Find the length of the diagonal 𝐴 𝐶 giving the answer to two decimal places. 𝐴 𝐵 𝐶 𝐷 is a parallelogram where 𝐴 𝐵 = 4 . 3 c m and the diagonals 𝐴 𝐶 and 𝐵 𝐷 make angles of 4 9 ∘ and 9 4 ∘ respectively with the side 𝐴 𝐵 . Find the length of the diagonals giving the answer to three decimal places. 𝐴 𝐵 𝐶 𝐷 is a trapezium where 𝐴 𝐷 ∥ 𝐶 𝐵 , 𝐴 𝐷 = 4 c m , 𝐴 𝐵 = 1 7 c m and 𝑚 ∠ 𝐵 𝐴 𝐷 = 1 0 8 ∘ . Find 𝑚 ∠ 𝐷 𝐵 𝐶 giving the answer to the nearest minute. 𝐴 𝐵 𝐶 𝐷 is a parallelogram where 𝑚 ∠ 𝐴 = 6 0 ∘ , the perimeter is 156 cm, the length of the small diagonal is 42 cm and 𝐴 𝐵 < 𝐴 𝐷 . Find the area of the ABCD giving the answer to the nearest square centimetre. 𝐴 𝐵 𝐶 𝐷 is a parallelogram where 𝑀 is the point of intersection to the diagonals, 𝐴 𝐶 = 1 8 c m , 𝑚 ∠ 𝐴 𝑀 𝐷 = 9 0 6 ′ ∘ and 𝑚 ∠ 𝐶 𝐴 𝐵 = 3 5 1 2 ′ ∘ . Find the length of 𝐵 𝐷 giving the answer to two decimal places. 𝐴 𝐵 𝐶 𝐷 is a parallelogram where 𝑚 ∠ 𝐴 = 7 9 4 2 ′ ∘ , 𝑚 ∠ 𝐷 𝐵 𝐶 = 6 8 4 2 ′ ∘ and 𝐵 𝐷 = 3 2 . 3 c m . Find the perimeter of 𝐴 𝐵 𝐶 𝐷 giving the answer to two decimal places. 𝐴 𝐵 𝐶 𝐷 is a parallelogram where 𝑚 ∠ 𝐵 = 1 1 4 ∘ , 𝑚 ∠ 𝐷 𝐵 𝐶 = 5 5 ∘ and 𝐵 𝐷 = 2 2 c m . Find the perimeter of 𝐴 𝐵 𝐶 𝐷 giving the answer to two decimal places. 𝐴 𝐵 𝐶 𝐷 is a quadrilateral where 𝐴 𝐵 = 1 4 c m , 𝐵 𝐶 = 2 8 c m , ∠ 𝐴 𝐵 𝐶 = 9 0 ∘ , ∠ 𝐵 𝐶 𝐷 = 6 9 ∘ and ∠ 𝐶 𝐷 𝐴 = 8 4 ∘ . Find the lengths of 𝐴 𝐷 and 𝐶 𝐷 giving the answer to two decimal places. 𝐴 𝐵 𝐶 𝐷 is a quadrilateral where 𝐴 𝐵 = 2 4 c m , 𝐵 𝐶 = 1 8 c m , 𝐶 𝐷 = 9 c m , 𝐴 𝐶 = 3 0 c m , and 𝑚 ∠ 𝐴 𝐶 𝐷 = 6 8 1 2 ′ ∘ . Find the length of 𝐴 𝐷 to the nearest centimetre and the area of 𝐴 𝐵 𝐶 𝐷 to the nearest square centimetre. The side length of a regular octagon is 39.7 cm. Find the length of the diagonals 𝐻 𝐵 , 𝐻 𝐶 , and 𝐻 𝐷 , giving your answer to three decimal places. The height of a tower is 139 m and the height of an office building is 54 m. From a point on level ground between them, the angle of elevation of the top of the tower is 6 8 ∘ and the angle of elevation of the top of the office building is 4 8 ∘ . Find, to the nearest metre, the distance between the top of the tower and the top of the office building. 𝐴 𝐵 𝐶 𝐷 is a parallelogram where 𝑀 is the point of intersection to the diagonals, 𝐴 𝐶 = 2 0 . 5 c m , 𝑚 ∠ 𝐴 𝑀 𝐷 = 1 4 2 ∘ and 𝑚 ∠ 𝐶 𝐴 𝐵 = 6 5 4 8 ′ ∘ . Find the length of 𝐵 𝐷 giving the answer to two decimal places.